"Working with Revolution Sound was an experience that was better than I could have hoped. The staff was professional, down to earth, imaginative, and hospitable. My producer, Dave Brophy was highly skilled at his craft and helped me pull out all the hidden gems in my music while keeping it true to my sound. We also had so much gear to choose from and that made exploring the possibilities even more enjoyable. I'd work with them again any day!" "There's no better way to say this: Andy Pinkham has the Best Ears in Boston! He is a GREAT engineer, and I've had the pleasure of working with him on all five of my albums. Whether we're tracking full songs or working on vocals overdubs, Andy is someone whom I trust completely to get me the best sounds possible. He is able to work fast AND get great tracks while keeping the environment relaxed and fun. Andy has an easy going way about him, and when I work with him, I feel inspired and supported as an artist. He is also a talented mix engineer and instrumentalist and has played bass and guitar on tracks for me as well. Andy is my ‘go to guy’ for top notch recording. and I recommend him to any musician who wants to make great music while having a great in-studio experience!" "My latest record was a bucket list record! Create as we go, and see what happens. The results were incredible! Andy and Dave's creativity around minimal song ideas I had brought in were just as much of the songwriting process as the original draft. I would purposely leave the studio and let go of the reigns just so I could return later to experience a new creative avenue I never would have thought of. "Working at Revolution Sound made the process of tracking my album straight forward and pleasurable. They have a ton of great gear and the amazing staff. It's easy to be creative and get the product you're after. One of my favorite studios, hands down." “Revolution Sound is the perfect combination of Hi-Fi and Lo-Fi. It's got what you need from a high end studio, but you still feel like you're at your buddy's house and the coffee never ends. Yes, there's lots of cool gear (those vintage amps!) but the real gem is the people. "Andy Pinkham and his team at Revolution Sound have the experience, equipment, and audio knowledge to get the job done right, at a reasonable cost, and with amazing results. As a client over many years with award-winning projects for Sesame Street, Bridgman/Packer Dance, and my improvisational brass band Revolutionary Snake Ensemble, it is clear that care is put into personalized service with a goal of great sound and great music." Our main recording space is welcoming, intimate and acoustically neutral. The live room is isolated from the rest of the building and has sight lines to the control room and booth, it’s easy for bands to play together while we retain sonic control and separation. It’s also home to our well kept, 70’s vintage, Kawai KU-5D Upright piano. We’re fans of today’s great digital pianos but when your music needs an organic sound this Kawai is a great option. Control Room A is unique to the Boston area, offering a blend of high end gear, professional staff and services at an affordable rate. It features a 32 I/O Pro Tools HDX system, a live room and two iso booths. The control room is stocked with 28 channels of vintage and modern mic preamps, plenty of outboard gear and lots of software. Control Room B Choosing this room is an ideal way to reduce overhead while still being plugged in to the main hive at Revolution. Artists can flesh out song ideas and arrangements in the solitude this room offers then move to the A room for tracking drums or mixing. A Universal Audio Apollo interface provides the front end while Adam and NHT monitors provide playback. B is built for natural sound, acoustic design Lou Clark, of Sonic Space. This room has a sweet selection of outboard as well by Universal Audio, Burl, API and dbx. Basses. There are plenty of options for basses at Revolution. Many of the options are of the vintage/vintage inspired variety with instruments like a Danocaster, Fender, Gibson, Harmony, and Kay. Like our guitars, we always have a few unique pieces, like our 1970’s Japanese Sekova Vulcan and the 1960’s Airline Pocket Bass. Amps. There’s a reason we use Marshall, Vox, Fender and Mesa amplifiers, they make that great and familiar sound we love. We have those amps in the studio, among others. It’s these ‘others’, however, that stand out and get used daily. We have a modest collection of vintage Silvertone, Ampeg, Gibson, Guild and Premier amps. These gems are unique and not replicated with software. When a guitar or bass part needs a distinctive sound and pedal or a plugin won’t do, we put these tools to work. DRUMS. 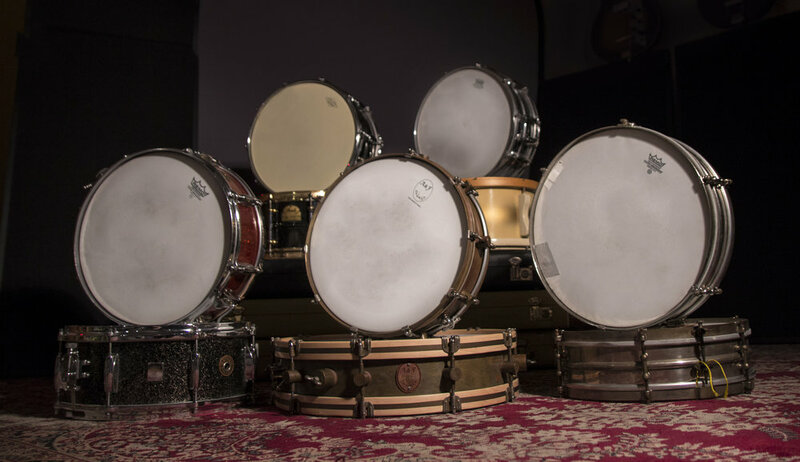 Revolution Sound Studio houses Dave Brophy’s comprehensive collection of vintage Gretsch and Slingerland drum sets, snare drums and cymbals. Ranging from the 1940’s to the 1970’s. The collection also includes a few Ludwig drums and modern pieces by A&F drums which sound incredible. Get a warm, dry sound in the A room or open up the doors and get a cavernous hallway vibe. No matter what drum sound you have in mind, Revolution Sound has you covered. Rates start at under $200/day. YEAH! Add me to your email list. Nah, I don't like getting emails. Thanks for sending us a note. We’ll get back to you very shortly. Usually in about 24hrs. We are located in the Boston area. Parking is available at no cost. Click here for public transportation directions and here for driving directions. Dave Brophy is a drummer/producer with over 25 years of professional music experience. Dave attended Humber College in Toronto, ON, where he majored in Jazz Performance and went on to earn a Master of Music degree from Manhattan School of Music in New York, NY. When not on the road, Dave calls Cambridge, MA home. In 2016 Dave was nominated for the Boston Music Awards “Session Musician of the Year" and "Producer of the Year". He also co-produced the 2014 BMA “Album of the Year” National Throat by Will Dailey, and he produced and co-wrote 2016 New England Music Awards “Album of The Year” Domestic by Ruby Rose Fox. Andy Pinkham, owner, engineer, producer, guitarist, and keeper of studio secrets. He received a BA from Berklee College of Music and for the past 25 years has provided Boston area musicians with a relaxed and creative recording environment here in Charlestown. Aaron Shadwell is a seasoned singer songwriter in the Boston area. In addition Aaron has spent several years in the video edit room and audio control room. His main focus here at Revolution Sound Studio is to connect artist and bands with the right plan, people and equipment for their recordings. Matthew Girard graduated with a degree in Music Production Technology at the Hartt School, Matthew has been recording artists in Boston and across the country. He also frequently collaborates with Bopnique Musique in their studios in Nashua NH and Los Angeles CA with multi-platinum producer Anthony J. Resta. Matthew has guested on countless recordings for artists (bass, trumpet, euphonium, guitar, percussion, and keyboards) resulting in a 2016 Boston Music Award Nomination for Session Musician of the Year. Outside of the studio, he is the FOH/production engineer for the a cappalla band The House Jacks.